The end of November. This year has gone so fast, and soon we'll be faced with the new year and all it will bring. It doesn't feel like November because this year, although the temperature has risen, we haven't had much humidity. 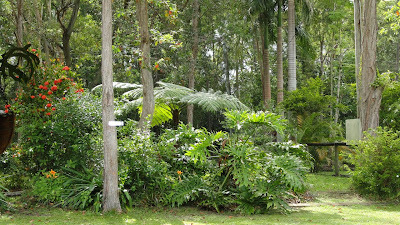 In the tropics and sub tropics, where we live, it's not the heat that affects you, it's the humidity. But we're still sleeping with a quilt and a blanket on our bed and usually, during November, we have just a sheet and the fan on. I wonder when it will change. We had a wonderful weekend. It showered on and off but the first match of the test cricket started so I had to watch some of that. In years gone by it used to mark that last part of the school year just before Shane and Kerry had six to eight weeks off school, and sometimes we'd go away to visit family or friends. In those days I would use the end of November to relax and prepare for Christmas and the summer holidays, with one eye on the cricket, and I always sat down and watched the first few overs, if not the entire day's play. I couldn't do that this year because I've been concentrating on the book, but I did sit and watch the first few overs while I did a bit of knitting. Some days it seems like all I do is write but I'm not complaining, I am very grateful for the opportunity I have to work with Penguin. Besides, who would complain when every time I look up, I see what is in the photo above. That is the view from the window where I sit most of the day typing my words. The greenery here envelopes and protects us from the hot sun and the little single vehicle lane way that leads to our door carries only our neighbours coming home or an occasional car that is lost. Our back boundary is an ever flowing creek so most days here are quiet and slow with bird song rather than traffic noise surrounding us. No, I have nothing to complain about. 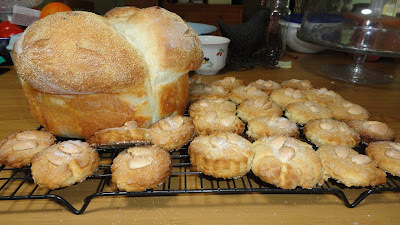 I did do some baking on the weekend. Bread and biscuits|cookies were made and now we have two jars of biscuits to have with our tea that should last a couple of weeks. 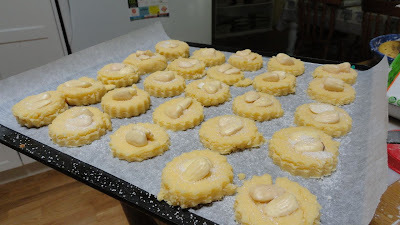 The biscuits were made using the cheap and easy biscuit recipe on the forum. 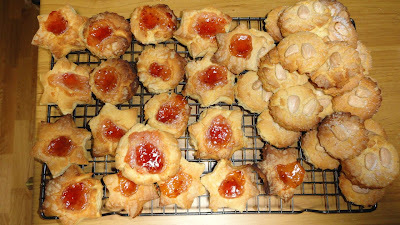 One lot I turned into jam drops, the others have almonds. Apart from some knitting, cooking and making the bed, the only other thing I did on the weekend was talk on the phone to my sister Tricia, my DIL Sandra and my friends Diane and Susan. Tricia sold her house and is in the process of buying a much smaller cute cottage higher up in the Blue Mountains. I can already see what she will do with her cottage and I'm really excited for her. It's a little two bedroom home, built a long time ago with many of the original features still there. I particularly love the old wood stove in the kitchen that looks like a little Aga and she even found the original wooden wire screen doors under the house. It will be a labour of love to do the small amount of renovating she'll be doing and I'm looking forward to many visits there sitting in the kitchen with that fire burning and the snow falling. But far away from thoughts of snow is my last tale to tell you. I picked THE pineapple yesterday. Those of you who've been reading here for a while will know that we planted a pineapple top a couple of years ago. 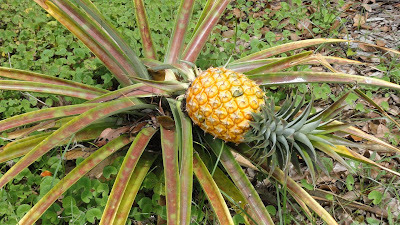 We harvested the first pineapple a year after we planted it, then had to transplant it to the front garden. Well, it grew another healthy looking pineapple - pineapples usually set fruit for two years - and tonight I'll be cutting it open so we can eat a couple of juicy chunks for dessert. While I was out in the garden, I also picked some red and orange lilies and gardenias for the table. Our garden is full of flowers right now so how could I resist bringing the fragrance of gardenias into the house. I hope your weekend was what you wanted it to be. I wish you well as we go into that busiest of seasons in the run up to Christmas. Enjoy your days. I'm glad to see you were busy :) :) Those biscuits/cookies look wonderful. Absolutely delicious...especially the ones with the jam on top :) :) Australia is definitely on my list of places to visit. It has been ever since I was in high school...and when I saw the photo of your view outside your window. Well, it reminds me of what makes Australia so beautiful. The pineapple looks wonderful. Did it taste as good as the photo looked? I'm salivating just looking at the photo of that pineapple. I have no doubt it will be the sweetest, juiciest pineapple you (and whoever is lucky enough to share it with you) have ever tasted. We also had a lovely weekend although the rain down here is a bit to constant at the moment and we are starting to get webbed feet. Your view from your desk is so nice and as I look out from my window in my little sewing/office I see lovely green hills shroaded by mist and birds enjoying the worms that have come to the surface of our very wet lawn. The cricket has been on most of the weekend in our home as my 88 year old Dad and the big fellow where both keen cricketers. I remember before my parents had TV when the tests were in England, my Dad would go to bed with the radio close to his ear listening to the broadcasts [much to my Mothers disdain] I have even seen him with the cricket on the TV, the radio tuned to the cricket and reading a book at the same time. My Mum would just shake her head. Have a great week. It was a breath of summer that made its way from your garden bouquet to my home as I sit her looking at a winter wonderland of frosting (snow) covering the forest landscape in my yard. I love gardenias. Looks like you have much to keep you pleasantly busy for a while. Your view out the window is gorgeous. Good morning ladies! I'm pleased you enjoyed the summery photos. Those flowers are gorgeous! I absolutely love gardenias but haven't had much success with them here. Your pineapple looks luscious as well...hope you enjoyed it! Enjoy the pineapple! I remember reading when you blogged about it, I'd kind of forgotten about it. THE pineapple! Well done Rhonda and Hanno, I bet it tastes superb. The view outside my window is snow! It's hard to believe that you are living in a paradise, with pineapples, no less! Here in Calgary, Alberta, Canada we have had over a foot of snow in the last 2 weeks and it is what we call a "Winter Wonderland" (translates to Bloody Mess). So thank you for the pineapple update, I remember you planting it so many months ago. You post was a bright spot in a gloomy day! Thank you for sharing the pictures of your pineapple! My husband and I are vegan, and when we were married this summer, we celebrated with an elegantly presented pineapple! 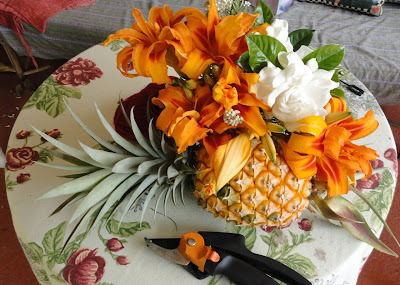 Your flowers with your pineapple reminded me of our wedding "cake". I have been reading and enjoying your blog for several months, but this is the first comment I have left. After seeing your photos today I was compelled to leave a comment. My husband and I have just returned home to the USA after a vacation to Queensland, Australia followed by a few days in Oahu, HI. Our son is doing a study abroad semester in Australia and we felt it was a wonderful time for us to visit the land down under. We loved every moment of our time spent in your beautiful country and wish we could have stayed longer. The tropical plants you show are lovely. While there we went into the Tamborine Mtns. and walked through the rainforest and went into the glow worm cave. So cool!! Also, while in Oahu we visited the Dole plantation and watched a demo. of cutting a pineapple. The demonstrator told us that you could plant the top of the pineapple, but it would take a year to grow just one pineapple. After hearing that, I can imagine how thrilled you must be to have harvested your pineapple. Sorry to go on for so long with my comments, it's just that I am still on cloud nine after that wonderful trip. What a gorgeous pineapple!! I've been wanting to plant it in my yard too. I read that you can grow pineapples quite easily, just buy one with the top from fruit shop and cut the top off to plant. I haven't found a pineapple with healthy top yet. But I'll find it soon. 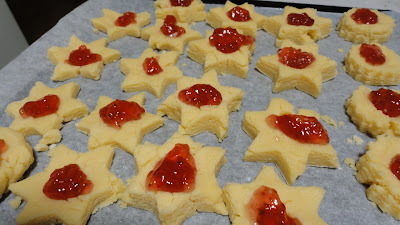 Enjoy the pineapple, jam drops and all other food you made, they all look yummy! Hi Kristy, I'm writing a down to earth book, it will reflect the blog and, hopefully, give a bit of inspiration for others to live as we do. I have a contract with Penguin and publication date is February 2012.